The gap in income growth between the richest and the poorest American families is staggering, as data to be published January on EPI’s State of Working America (SWA) Web site show. The Chart, from the forthcoming SWA Web site, shows what the concentration of income growth at the top of the income scale has meant, in dollars and cents, for the typical American family. Between 1979 and 2005, households at the bottom fifth of the income scale have seen an average, inflation-adjusted income growth of just $200. Importantly, that does not represent an average annual increase in income of $200, but rather, an increase of $200 over the entire 26-year period. By contrast, a small number of households at the top 0.1% of the income scale saw average income growth of almost $6 million over that same period. Some have argued that income inequality is not significant since it only means that the rich are gaining income at a faster pace than everyone else. 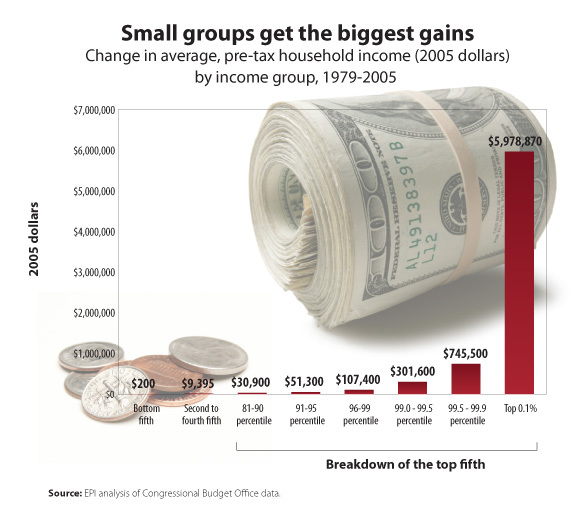 But SWA’s picture of extremely lopsided income growth illustrates that the richest Americans are claiming so much of the country’s total income growth that there is not enough left over for most families to see anything but sluggish growth. These latest patterns of extremely uneven income growth stand in stark contrast to the period between 1947 and 1973, when income growth was distributed roughly equally across income classes, with the poorest 20% of families seeing income growth at least as fast as the richest 20%. For more information about EPI’s research on income growth and inequality, visit the new State of Working America Web site in January.